On Friday, passengers at the Paddington train station in London came across an unusual sight - an abandoned box with holes in the top, just sitting on the platform. The box was labeled "For Heathrow Customs Quarantine," with no other labels or clues as to what the box held. 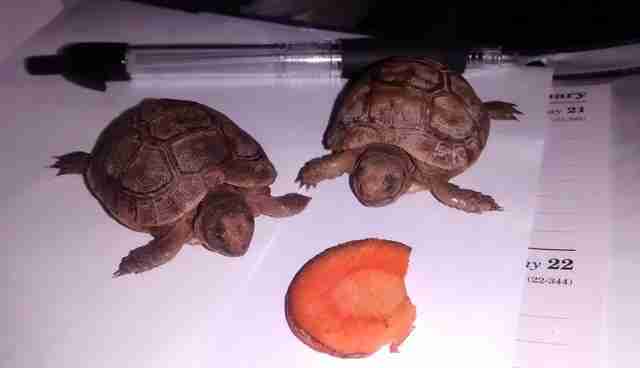 Station officials approached the box, carefully opened it - and found two baby tortoises inside, just waiting to be rescued (or perhaps for a train). The adorable babies were taken to the station manager's office, where they got to roam around a desk, an unusual and adorable sight in the middle of an urban train station. The RSPCA was called, and inspector Phillip Norman came to collect the tiny passengers. "It's safe to say the employee was somewhat shell-shocked to discover the reptiles waiting on the platform at the station just ahead of Friday evening rush hour," Norman said in a press release. The tortoises, believed to be Burmese mountain tortoises or spur-thighed tortoises, have since been named Shelby and Sheldon and are doing well. It is still unclear why or how they ended up at the train station in the first place. "We think this speedy pair may have been trying to catch the Heathrow Express to the airport," Norman said.